Figure 1. 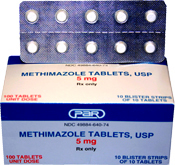 Generic and brand name (Tapazole®) varieties of methimazole. Both varieties typically come as 5 and 10 mg. tablets. 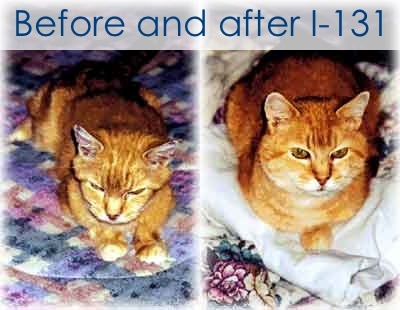 HYPERTHYROIDISM has become a common and well recognized disorder of middle-aged to older cats. Medical treatment with antithyroid drugs of the thionamide class, which act to block thyroid hormone synthesis and thereby lower high circulating thyroid hormone concentrations, can be of great value in the short-term control of the hyperthyroid state. Antithyroid drugs also play an important role in preoperative preparation for successful thyroidectomy. Advantages of long term antithyroid drug treatment over surgery include absence of certain complications such as permanent hypothyroidism and postsurgical hypoparathyroidism. In addition, unlike surgery or radioiodine, use of antithyroid drugs requires no advanced skills, training, or special licensing. Therefore, it is a practical treatment choice for most practitioners. Propylthiouracil (PTU) and methimazole are the two thionamide antithyroid drugs available for use in the United States. The use of PTU for the treatment of feline hyperthyroidism will, in most cases, effectively lower circulating thyroid hormone concentrations to within normal range. In the cat, however, PTU produces a high incidence of mild to severe side effects, which include vomiting, anorexia, lethargy, thrombocytopenia, immune-mediated hemolytic anemia, and the development of serum antinuclear antibodies. Gypsy,” a cat previously treated with methimazole for hyperthyroidism. Notice the bilateral hair loss and healing excoriations on this cat’s face and neck. 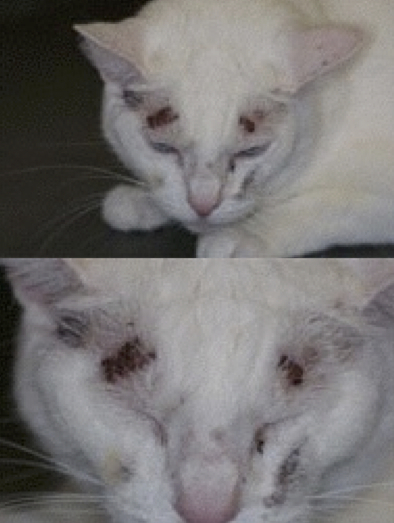 These lesions resulted from self induced trauma as the result of the profound facial pruritus (itchiness) that can accompany methimazole administration in some cats. for 30 to 1,000 days as sole treatment for the hyperthyroid state. After 2 to 3 weeks of methimazole therapy (10 to 15 mg/d), the mean serum thyroxine (T4) concentration decreased significantly (P < 0.001) from a pretreatment value of 12.1 µg/dl to 2.1 µg/dl. The final maintenance dose needed to maintain euthyroidism in the 81 cats that were given methimazole as sole treatment for hyperthyroidism ranged from 2.5 to 20 mg/d (mean, 11.9 mg/d). Clinical side effects developed in 48 (18.3%) cats (usually within the first month of therapy), which included anorexia, vomiting, lethargy, self-induced excoriation of the face and neck, bleeding diathesis and icterus caused by hepatopathy. Mild hematologic abnormalities developed in 43 (16.4%) cats (usually within the first 2 months of treatment), which included eosinophilia, lymphocytosis, and slight leukopenia. In ten (3.8%) cats, more serious hematologic reactions developed including agranulocytosis and thrombocytopenia (associated with bleeding). These hematologic abnormalities resolved within 1 week after cessation of methimazole treatment. Immunologic abnormalities associated with methimazole treatment included the development of antinuclear antibodies in 52 of 238 (21.8%) cats tested and red cell autoantibodies (as evidenced by positive direct antiglobulin tests) in three of 160 (1.9%) cats tested. Figure 3. A cat previously treated with methimazole for hyperthyroidism. 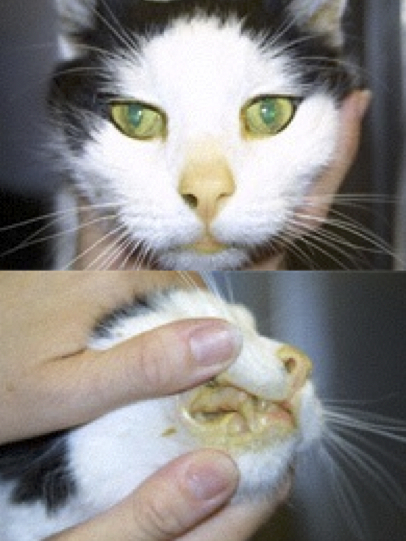 Notice the jaundice (yellow appearance to the mucous membranes) as the result of the hepatopathy that develops following methimazole administration in some cats. Clinical side effects developed in 48 (18.3%) of the 262 cats and included anorexia, vomiting, lethargy, self-induced excoriations of the face and neck, bleeding diathesis, and icterus associated with hepatopathy. In most cats, gastrointestinal signs developed during the first month of therapy and resolved despite continued treatment. In eight cats, however, anorexia and vomiting persisted until methimazole treatment was discontinued. Similarly, although the facial and cervical excoriations that developed in six cats were partially responsive to treatment with glucocorticoids, cessation of methimazole was required in all cases. The bleeding diathesis (epistaxis or oral bleeding) associated with thrombocytopenia in five cats resolved within 5 days after cessation of methimazole. In all of the cats in which bleeding developed, drug administration was stopped and none were rechallenged with methima-zole. A hepatopathy developed in four cats within the first 2 months of treatment and was characterized by sharp increases in serum concentrations of alanine aminotransferase (500 to 2,150 IU/l; normal, 10 to 80 IU/l), aspartate aminotransferase (200 to 349 IU; normal, 10 to 60 IU/l), alkaline phosphatase (165 to 422 IU/l; nor-mal, 10 to 80 IU/l), and total bilirubin (3.5 to 8.0 IU/l; normal, 0 to 0.5 IU/l), as well as clinical signs of anorexia, vomiting, lethargy, and icterus. After cessation of methimazole therapy, these clinical signs and abnormal biochemical findings resolved within 7 and 45 days, respectively. Rechallenge with the drug in one cat again induced clinical signs and serum biochemical abnormalities indicative of hepatic disease within 10 days. Results of liver biopsy examination, performed in one cat, showed hepatic degeneration and necrosis. Mild hematologic abnormalities developed in 43 (16.4%) of the 262 cats and included eosinophilia (> 1400 cells/µl) lymphocytosis (>6000 cells/µl), and leukopenia (<5500 cells/µl) with a normal differential count. These hematologic findings, which were usually noted in the first 1 to 2 months of treatment, were not associated with clinical disease and were usually transient despite continued therapy. Figure 4. “Luna” is another cat previously treated with methimazole for hyperthyroidism. Notice the healing excoriations on this cat’s face. 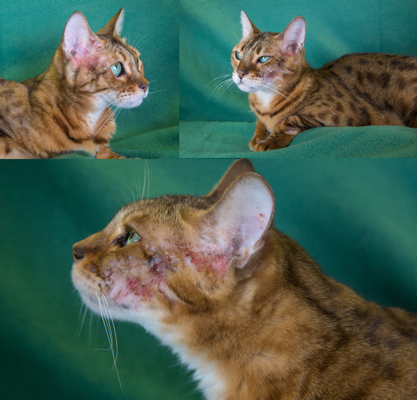 These lesions resulted from self induced trauma as the result of the profound facial pruritus (itchiness) that can accompany methimazole administration in some cats. More serious hematologic reactions developed in ten (3.8%) cats, and included agranulocytosis (severe leukopenia with a total granulocyte count <500/µl) and severe thrombocytopenia (platelet count <75,000/µl). Both agranulocytosis and thrombocytopenia developed in one cat. In two of the seven cats with thrombocytopenia, overt bleeding had not yet occurred. These serious adverse effects developed within the first 3 months of treatment, but resolved by 7 days after cessation of methimazole administration in all cats. In one cat in which agranulocytosis developed, rechallenge with methimazole again produced severe neutropenia (44/µl) 7 days after reinstitution of the drug. In general, the dose of methimazole that the cats were receiving at the time clinical and hematologic side effects developed ranged from 10 to 20 mg/d, with mean and median dosages of approximately 15 mg/d. There did not appear to be a relationship between the development of these adverse effects and the daily methimazole dosage. Of the 160 cats tested, a positive DAT developed in three (1.9%) during treatment, consistent with the presence of anti-red blood cell (RBC) antibodies. 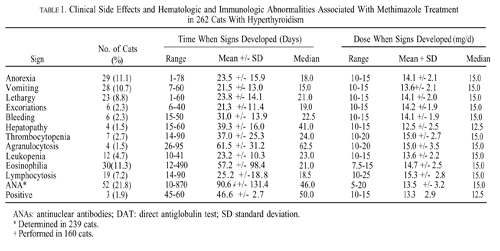 Despite the formation of these autoantibodies, none of the cats showed any clinical or hematologic evidence of illness (i.e., hemolytic anemia).